How many players choose to become a one-format specialist? Stuart Broad wants to state his case for inclusion in England’s one-day side. Unfortunately for him, this is difficult as he doesn’t actually play one-day cricket. According to Ali Martin, Broad’s played one 50-over game for Nottinghamshire in the last 18 months. The opposite applies to Jos Buttler, who is keen to return to the Test side. He somehow needs to make red ball runs to get back in, but the only way we can see that happening is if he paints one ahead of a limited overs game. Then there’s Eoin Morgan, who’s basically just given up – he says he’s averaged three or four first-class games a year for the past six years and can’t see that changing. That’s not actually a huge amount more than we play and it’s a problem that’s doubtless compounded by being dismissed for single figure scores in the first couple of matches while he tries to remember what’s what. Other than pigeons, few voluntarily enter pigeonholes. We’ve long had players retiring from one format to prolong their lifespan in another, but the specialist threshold seems to have shifted in recent times. If players in their prime are not exactly being forced to choose, then they are at least allowing themselves to be funnelled down a particular path because it’s so much bloody effort to do anything other than that. The impact of this on fans is significant and appalling: it means we have to try and remember more cricketers. If we were interested in paying attention and remembering lots of things, we’d have gone and got a law qualification or something. When did Eoin Morgan become England’s short format ‘anchor’? The way I see it, they have to find a way to get Buttler back into the Test team. He was playing an unnatural game last summer. He needs to bat at seven or eight and be told to play his shots with no fear, as Stokes does. Just don’t follow T20. That’s a good amount of players you only have to bother researching when the World Cup comes along. Problem solved! By the way, has 24SevenBetBot taken its last chance? No, oddly. Maybe it’s busy working up some new opinions. 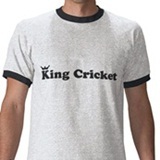 I didn’t realise our monarch was a first-class cricketer…..
No, that’s actually precisely what we meant. We don’t play cricket at all and even allowing for that, Eoin Morgan only plays three or four first-class games more than us. Ah, I see. Clearly that went further over my head than a bouncer on a concrete pitch bowled at Harry Pilling. Dignity salvaged by a Harry Pilling reference. Also by the fact that we worded it poorly and miscomprehension was therefore quite likely. I’m relaxed about some players finding themselves specialising in one format or another as their talents/careers settle. I worry more about players being pigeon-holed too early and/or youngsters being put through a homogeneous set of trials and opportunities that might exclude those who develop unusually late or in unusual ways. Would Lasith Malinga ever have been picked up by the English system with his quirky style? Would Dirk Nannes have found his way to elite cricket in England after plying his skills at skiing and saxophone earlier in life? I do agree with those who say that the jury is still out on Buttler regarding multi-formats though. But I do think we’ve seen enough to agree that Eoin Morgan is best focussing on the white ball and Ali Cook best focussing on red ball only. That last paragraph… 🙂 There was a time when I actually _genuinely_ followed cricket. And talked about it on Usenet (showing my age here). Nowadays, I only follow people – like you – who still follow cricket and I’ve barely got a clue of who is who in the England team. 🙁 Never mind bloody Lancashire that I’m supporting too (in theory). We much prefer our readers uninformed. It makes it so much less likely that they’ll point out all the flaws in our half-formed opinions. Stuart Broad could at least rest satisfied with the Miss GB title, after it was stripped from one Zara Holland, due to their interactions with one Alex Bowden. This shall truly make them the Archbishop of Cricket. Although it would be amusing if this whole ruckus were somehow related to a crooked-fingered umpiring gesture. Where is the ICC’s Test mace? How will England beat South Africa in the second Test?